My QFFs and I had a wonderful time on the shop hop! Barb was a gracious hostess, letting us all stay at her place on Friday night. And it’s always fun to spend time with Bev! We didn’t get to all the shops on the list 😦 But we made the most of the one’s we did visit! Each shop had a sample quilt to show. We three QFFs agreed that this was our favorite version of the quilt. Didn’t she do a wonderful job!?! 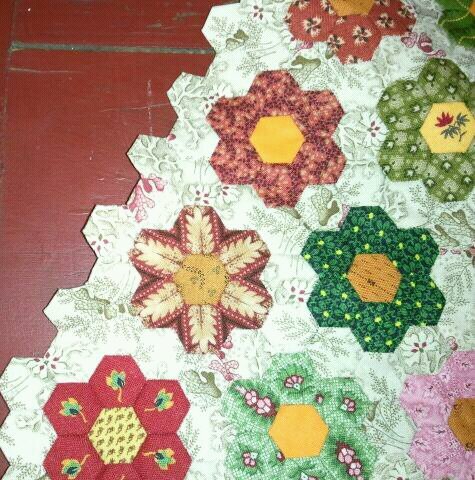 This is going to be a center medallion in a lap quilt. I can’t wait to see the finished quilt. Gotta go work for the other boss today. Had a great time with you and Bev this weekend! Can’t wait until we set another date and place for our next get-together for November. I love this once-a-month special times.